With the 2018 NFL draft rapidly approaching, it’s time to kick off this year’s fantasy scouting reports. Below you’ll find the pre-draft fantasy evaluations of the signal-callers in this year’s class. This is a very interesting class with a number of potential future fantasy standouts, all of whom are likely to come off the board on Day 1 of the draft. The fantasy shelf-life of quarterbacks is by far the longest of the skill positions, so it’s important we have a good grasp of each player in this year’s class. Remember, ranking players is a process that continuously changes as we get new pieces of information. The biggest piece won’t come until late April when the player is either drafted, signed as an undrafted free agent, or passed over by the 32 NFL teams. For now, all the incoming players exist in a vacuum without a team and can be compared on even ground. 1. Lamar Jackson, Louisville — Elite running quarterback with over 4,790 rushing yards and an average of 8.3 yards per carry over his three-year career. Improved as a passer in terms of accuracy from 2016 to 2017, upping his completion percentage from 56.2 to 59.1. This suggests he’s perhaps a little underrated with what he can do with his arm as a fantasy asset. Averaged 8.3 yards per attempt and tossed 69 touchdowns at the college level. Has a very thin build (6-3, 200), but is off the charts from a speed an athleticism standpoint. For fantasy purposes, it’s tough to not draw comparisons to vintage-era Michael Vick. If Jackson hits, his dual-threat ability gives him a ceiling in the elite QB1 territory. 2. Sam Darnold, USC — An argument can certainly be made for Darnold as the top future fantasy option among this year’s quarterbacks. He certainly looks the part of an NFL signal-caller at 6-4, 220. He followed up his breakout 2016 season with 4,135 yards and 26 scores last season. Graded out No. 3 in the nation in throws to the middle of the field, and No. 2 in intermediate throws. Calm in the eye of the storm with an adjusted completion percentage of 79.0 against the blitz, which is tops among draft-eligible signal-callers. Ball security can be an issue, as he had 13 picks and 9 lost fumbles last season. He isn’t the most dynamic runner but did average 5.4 rushes per game and scored five touchdowns in 2017. For fantasy purposes, he comps very similarly to Matthew Stafford, which means long-term QB1 value is likely in the cards for Darnold. 3. Baker Mayfield, Oklahoma — Dominant in PFF grading, finishing as the No. 1 quarterback in 2016 and 2017. Was one of just two quarterbacks to top 4,000 yards in the 2017 regular season, and posted a massive 11.8 yards per attempt. Tossed 37 touchdowns and just five interceptions, and completed 71.3 percent of his throws. Excellent on deep balls, completing 38-of-67 (with five drops) for 1,452 and 13 scores. Arguably the best quarterback in the class when under pressure. Had an accuracy rate of 70.6 percent in the face of pressure. Biggest knock on Mayfield is his size, but also should be noted that he comes from a spread system at the college level. Has a wide range of potential fantasy outcomes but has the arm talent to be a poor man’s Drew Brees for fantasy purposes in the long term. 4. Josh Rosen, UCLA — Very productive signal-caller who looks the part for the NFL level. Tossed 59 touchdowns in 30 career games. Performed well under pressure, managing an accuracy rate of 68.9 percent in the face of pressure. Polished passer who excels on intermediate throw, completing 60.6 percent of passes 10-19 yards from the line of scrimmage in 2017. His aggressive tendencies bode well for upside, but could also lead to turnovers. Ranked just 24th out of 38 draft-class qualifiers at avoiding turnover-worthy throws. Doesn’t have the biggest arm. He also graded out 24th in deep-ball passing. Durability could also be a concern. He had two concussions last year and suffered a shoulder injury that ended his 2016 season at the college level. Rosen has the potential to be a future fantasy QB1, but his somewhat limited overall upside makes it unlikely for him to ever emerge as an elite option. That being said, he certainly capable of having a similar fantasy trajectory to someone like Eli Manning. 5. Josh Allen, Wyoming — The biggest question mark among this year’s top quarterback prospects, Allen has arguably the highest ceiling, but also the lowest floor. Made a rapid rise from the community college level to Wyoming. Showed the ability to put up big passing numbers in his sophomore season with 3,203 passing yards and 28 touchdowns, but also threw 15 picks. Accuracy was an issue, as Allen completed just 56.2 percent of his throws at Wyoming. But Allen has a big-time arm and is capable of making the spectacular make routine. In some ways, he’s this year’s version of Patrick Mahomes. Allen doesn’t have Mahomes’ resume, but his massive upside gives him a very appealing long-term fantasy outlook for those who are less risk adverse. 6. Mason Rudolph, Oklahoma State — Big-bodied (6-5, 230) player who graded out as our No. 2 quarterback in 2017 and No. 3 in 2016. Rudolph led all signal-callers with 4,904 passing yards to go along with 37 touchdowns and just nine picks in 2017. He isn’t a running quarterback but is capable of running read options. Scored 17 rushing touchdowns in his college career, including 10 last season. Rudolph put up big numbers, but he also had the benefit of throwing to a strong wide receiver corps and playing against Big 12 defenses. Despite his production at the college level questions exist about whether he’ll surface as a viable fantasy option at the pro level. 7. Luke Falk, Washington State — Prolific producer at the college level with over 14,000 passing yards and 119 touchdowns. Numbers were juiced in Mike Leach’s spread offense. Lacks mobility in the pocket causing him to take 40 sacks in 2017. That was 25.5 percent of his pressured dropbacks, which was fourth-highest in the nation. Has questionable arm strength and struggled on deep-ball passes. Excluding drops, he completed just 39.7 percent of his passes over 20 yards downfield. Comps to Mike Glennon don’t bode positively for future fantasy success. 8. Mike White, Western Kentucky — A 4,000-yard passer in each of the last two seasons, White started his career at South Florida, but really blossomed after transferring to Western Kentucky. Comes from a baseball background as a pitcher at the high school level, so arm strength isn’t an issue. Was solid on the deep ball – he completed 26-of-72 for 939 yards and 12 touchdowns – but only attempted a throw of 20-plus yards on 13.8 percent of his attempts last season. Struggled against pressure, taking 39 sacks in 2017. Performed well in the Senior Bowl, but is a bit of a long shot to become a fantasy factor outside of deep 2QB leagues. 9. Riley Ferguson, Memphis — Began his college career in Tennessee, when he redshirted his freshman season after breaking his tibia. Ferguson left the team after that season and made his way to Memphis after spending a year at the community college level. In two years at Memphis, he put up 7,955 passing yards and 70 touchdowns. A tad on the thin side (6-4, 210). Sacked just nine times in 2017, which was 9.3 percent of his pressured dropbacks. Only eight quarterbacks were sacked less frequently. Tough to envision him surfacing as a consistent fantasy option at the pro level. 10. J.T. Barrett, Ohio State — Dual-threat signal-caller who threw from 9,434 yards and 104 touchdowns in four years at Ohio State. Impressive runner with over 3,000 rushing yards and 43 scores on the ground. On the shorter side (6-1, 220) and struggles on deep ball throws. Barrett managed an adjusted deep-ball completion percentage of 37.0, which ranked just 42nd among qualifying quarterbacks. Barrett’s ability as a runner is intriguing, but his deficiencies as a passer make him a longshot to surface on the fantasy radar. 11. Kyle Lauletta, Richmond — Small-school signal-caller who posted solid production in 2017 with 3,737 yards and 28 touchdowns along with completing 64.9 percent of his passes. Despite the numbers, questions exist about his arm strength. Poor accuracy on deep-ball throws and a lack of velocity were contributing factors in Lauletta’s 12 interceptions last season. His deficiencies bode poorly for Lauletta at the pro level. He’s unlikely to ever surface on the fantasy radar. 12. Kurt Benkert, Virginia — A gunslinger with a big arm who ranked seventh in the class with an averaged depth of throw of 11.6 yards. Despite the arm talent, Benkert struggled with decision-making and tossed 21 interceptions over the last two seasons. Started his college career at East Carolina, but transferred out as a grad transfer after losing the starting job in 2015. Looks the part of an NFL quarterback, but his inconsistent play makes him more of a backup talent at the pro level. 13. Jeremiah Briscoe, Sam Houston State — Very productive small-schooler who played in a shotgun spread offense that juiced up his numbers. Tossed an FCS-record 57 touchdowns in 2016, and followed that up with 5,003 yards and 45 scores last season. Started his career at UAB but was forced to transfer after the program dissolved. Put up crazy numbers over the last two years, but also threw 26 interceptions. The numbers are intriguing, but his isn’t a dynasty fantasy option. 14. Logan Woodside, Toledo — Posted better numbers in 2016 with 4,129 yards and 45 scores, which was tops in the nation. Followed that up with 3,882 yards and 28 scores. Undersized (6-2, 201), but showed the ability to get the ball downfield with an adjusted completion percentage of 57.5 on deep balls (fourth in the nation). Also, excelled against the blitz, with a nation-leading 81.6 percent adjusted completion percentage. Showed plus athleticism at the combine with top performances in the 40-yard dash (4.79), vert jump (31.5″), 3-cone (6.94), and 20-yard shuttle (4.15). Despite some of the pluses, Woodside is a longshot to be a fantasy option. 15. Tanner Lee, Nebraska — Looks the part, but Lee struggled with accuracy in college. Posted a career completion percentage of 55.1 and ranked 36th out of 37 draft-eligible quarterbacks at avoiding turnoverworthy plays last season. Threw 16 interceptions in 2017. Started his career at Tulane. Has the makings of a future practice-squad option. 16. Chase Litton, Marshall — Productive passer who topped 20 touchdown passes in each of his three seasons at Marshall. Prototype size (6-6, 232), but struggled with turnovers, tossing 14 interceptions in 2017. Won’t be a fantasy factor. 17. 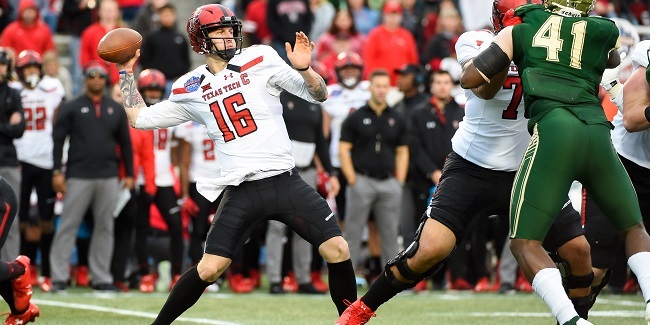 Nic Shimonek, Texas Tech — Patrick Mahomes’ successor threw for 33 touchdowns and 3,963 yards in 2017, but also struggled with consistency and ended up getting benched at the end of the season. Doubtful to ever be a fantasy option. 18. Nick Stevens, Colorado State — Very productive in 2017 with 3,799 yards and 29 touchdowns. Played in an offense with pro-style concepts and worked under center. Thin frame (6-3, 215) and not an effective passer downfield. Only attempted a throw of 20-plus yards on 15.2 percent of his throws. Not worth fantasy consideration. 19. Brandon Silvers, Troy — Efficient quarterback who profiles as a game manager type with average arm strength. Good decision-maker with the third-lowest percentage of turnover-worthy plays in the draft class. Projects as a backup at best at the pro level and isn’t likely to ever be a fantasy option. 20. Austin Allen, Arkansas — Brandon Allen’s little brother, he followed a productive junior season with a disappointing 2017 campaign. Was pressured on a massive 47.8 percent of his dropbacks in 2016 and 44.0 percent in 2017. Took a beating as a result and missed four games with a shoulder injury last season. Isn’t worth fantasy consideration. 21. Quinton Flowers, South Florida — Undersized (5-10, 210) but athletic, Flowers is a big-time playmaker. Tossed 71 touchdowns and 8,013 yards over the last three seasons, but accuracy was an issue with a career completion percentage of 57.7. Racked up 3,672 yards and 41 scores on the ground. 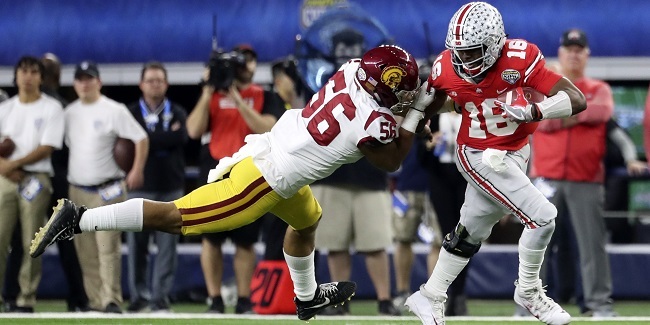 His size and deficiencies as a thrower will likely force Flowers to convert to running back.